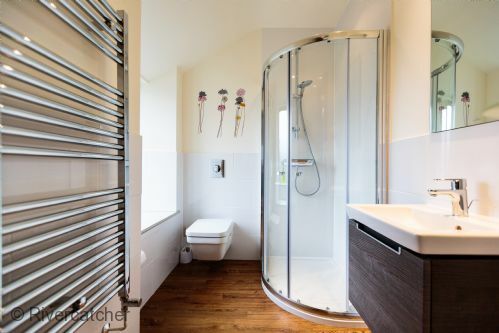 This luxury self-catering property has five en suite bedrooms, sleeping 10 people, each with its own design and character. It is light and airy with lots of space to spread out. From the glass fronted living room you step out onto your private patio area with large hot tub. With view of your spacious garden and views on the river. Cilan Farmhouse is perfect for a large family or a group of friends. All the bedrooms as standard are king-size doubles with the option of turning 3 of them into twins. My family and I stayed at Cilan Farmhouse to celebrate my 50th. The house is beautiful and so comfortable. Everything has been thought about in so much detail. Hot tub is fantastic, decor is stunning and plenty of room if you want your own space. Games room is also a great addition. Beautiful and idyllic location too. Highly recommend. Been here before and have returned. Nuff said ! Been here before and have returned. Nuff said ! Been here before and have returned. Nuff said ! On the strength of a very successful visit in March when a large group of us stayed in two other cottages at Rivercatcher (with 4 dogs between us! ), I booked Cilan Farmhouse for a smaller family group for a long weekend in December. Everyone was thrilled with the farmhouse. The lay out of the accommodation suited us perfectly. We rented Cilan Farmhouse and Gamekeepers Cottage as a party of 18 adults celebrating a 50th birthday with family and friends. We could not fault any aspect of the whole experience from initial booking to finish. The accommodation is superb and the location breath-taking even during a wet December weekend. We could not more highly recommend Rivercatcher to others and would love to repeat our experience their again in the future. Well done to everyone involved in this fantastic setup. The Rivercatcher complex is a beautiful setting to relax with friends and family. The cottages are furnished to a very high standard. The additional spa services are highly recommended. I would highly recommend these cottages for a break. Have stayed here three years running! Great location, ameneties and stunning views. This house has excellent accomodation which is ideal for group or family holiday. Each room is spacious and bedrooms all have ensuite bathrooms. There is so much space to accomodate 10 people and the garden and hot tub overlooking tge river is idyllic. Excellent facilities and very helpful friendly staff. Stayed as a family group of 9 plus our dog. All 4 generations had a great time. Plenty of room for us and all ensuite bedrooms was appreciated. Safe, secure large garden enjoyed by the kids and our dog. Adults loved the hot tub and having two seperate living rooms meant the kids enjoyed their own tv and dvd. Every ammenity has been thought of. Very high standard of accomodation. Dog loved paddling in the river which was literally accessible from the back garden. Great place for a special break for all ages to enjoy. Wonderful week with fantastic house and location. Everything was great and small niggles were sorted quickly. The only minor gripe would be the kitchen needs a knife sharpener as there is nothing worse than cooking with blunt knives. We really enjoyed the quiet and peaceful location. The hot tub was brilliant. Beautiful setting. House was great, plenty of room for everyone to have their own space. Great place to stay and great people to deal with. We had 9 adults and 2 children under 2 years old and we found the accomodation spacious ,clean and the rooms were very well appointed . The living areas, including kitchen were well equipped and as the weather was fantastic when we visited the outdoor areas were used most of the time. 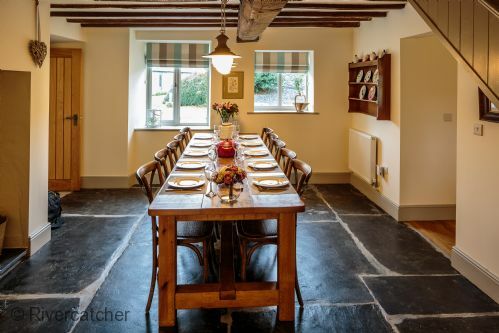 We used outside caterers for a celebratory meal as this suited us with the children and this worked really well as the dining area was beautifully located in the farm house. We all had a great time and we will certainly come back to this part of North Wales and explore further based from the luxury of Rivercatcher. Stayed with family and friends attending a wedding venue near by. We had a lovely three days in a beautiful and spacious accommodation and to top it all lovely weather, so we managed to dip in the hot tub, which was cleaned every morning by the staff. My only gripe would have been the pillows could have been more comfy. Would recommend this place to anyone. We're just back from a wonderful week with four generations of the family staying in Cilan Farmhouse. The accomodation was very comfortable, spacious and pleasantly presented. Careful planning has gone into making Cilan a very welcoming and easy place to stay. The essentials provided were most helpful, plenty of towels, t-towels, bin bags, dishwasher tablets etc. It was great to have one downstairs bedroom for one of our party who would have found the stairs difficult. There are plenty of places to sit together and in different groups. Due to the good weather we were able to sit outside to eat most meals, enjoying the lovely garden and surroundings, there is a large table and a BBQ. The Hot-tub was a bonus, sitting in it and watching the view was very relaxing. The maintenance man Aled, was very helpful and around most mornings so we could check things with him. Gorgeous property in to die for landscape! We went to celebrate our friends birthday and it was one of the best weekends away, mostly thanks to the property. 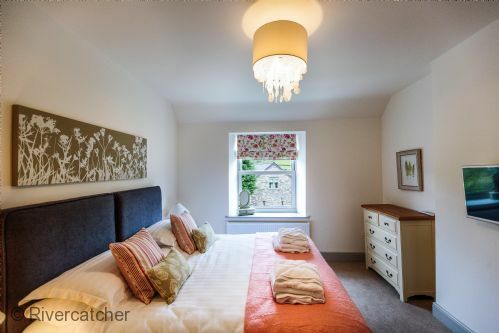 Fully kitted out and amazing bedrooms with a lovely garden with jacuzzi. Recent stay at Cilan Farmhouse was perfect in every way. It was great for a large group get together, everything about it was perfect, everyone had their own ensuite. There was 2 lounges and a large dining area. The kitchen was supplied with all utensils required. Several people in our party are talking about visiting again with family in the future and we may well visit again next year for our yearly get together as it will be hard to find somewhere like it. Can’t speak highly enough about it. We also used shepherds cottage which was smaller but just as good. We have just returned from an Easter break at Rivercatcher where we stayed at the Cilan Farmhouse. It was by far the best property we have ever stayed in and there is nothing you can fault. The location (even in the rain) was amazing and the owners were brilliant - not intrusive at all which I have found to be an issue at other rentals. We were fortunate enough to have a sneak preview of the new lodges which are out of this world, the only problem being you would want to try each one as they are all so unique!! We will definitely be making a booking soon. Cilian Farmhouse, property was excellent for the whole family. We spent my wife's 40th at the property as a surprise with the whole family and had a fantastic time, couldn't fault the place at all, it was perfect in every way, this was our third stay at Rivercatcher and i'm sure we will be back for more. Booking was easy, information provided was very useful, it was clean, it had everything you would need if you didn’t want to leave, the little touches like the welcome hamper was lovely. I couldn’t recommend this lovely place anymore. I can’t wait to come back. We had an absolutely amazing stay! The Farmhouse is very spacious even for 10 people, 1 dog and a baby!! The bedrooms were all furnished really well and all ensuite too. There was a lot of special touches,like a gorgeous hamper on arrival, dog blankets and baby facilities. Great for entertaining and enjoying meals together on the big dining room table. The outdoor hot tub got used a lot, overlooking the river. Close to lots of walks and a local pub. Would definitely recommend and stay here again. A Farmhouse of outstanding quality. You will want to return! Our group included 6 adults, a 3 month old baby, a one year old and a two year old! We chose the property as it appeared luxury/high end and we knew we would be spending a lot of time in the property due to the time of year and the younger members of our party requiring an early bed time – We were not disappointed. This was the best holiday house I have every stayed in. 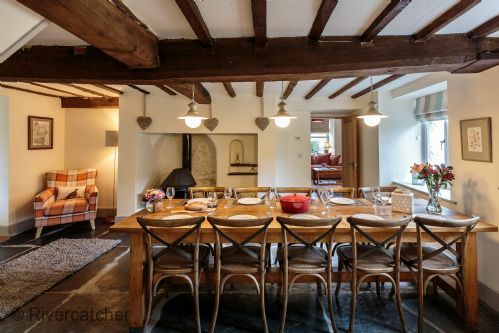 The house was spotless, warm and huge whilst retaining the cozy nature befitting a farmhouse in Wales. Booking, communication and arrival/check in were faultless. The grounds of the house are fantastic, river views, large fenced garden (gates to access the river). In the garden was an excellent hot tub with multiple jets and lights. This was always available to use and towels were provided in the lounge. The lounge was large, comfortable and warm with plenty of seating a modern television and access to the garden. TV Room was used for buggy’s, coats etc, but is also a large comfortable space. The dining room is charming, rustic and spacious with fisherman style lights and a large wood burning stove. Seating for 10 is easily achieved. 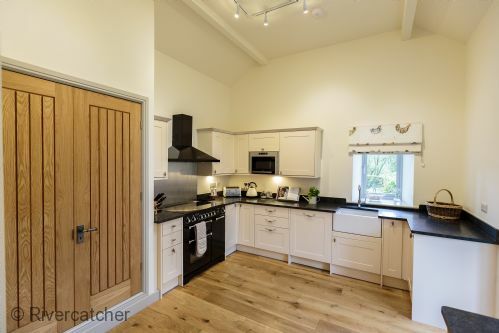 The kitchen is large, well equipped, high quality with lots of storage and a huge fridge, access to the garden here was handy. An additional breakfast table is between the lounge and kitchen as is a downstairs bathroom, both useful. All bedrooms are ensuite, very tasteful and clean with super comfy beds and high quality bathrooms. Games room (separate from house but literally 10 metres) has a good quality table tennis table, football table and wooden train set for the kids. The local pub is a belter, proper old school boozer with good home cooked food and less than a mile away (nice 20 min walk). En-route just happens to be a Michelin starred restaurant – Couldn’t really make this up! The owners clearly take great pride in the cottages as the others appeared maintained to the same high standards. Would definitely visit again. 12 of us stayed in 2 cottages and I'm sure between us we used, played with and tried everything and there was nothing to fault. Fantastic properties in a stunning location, we are already planning a return. 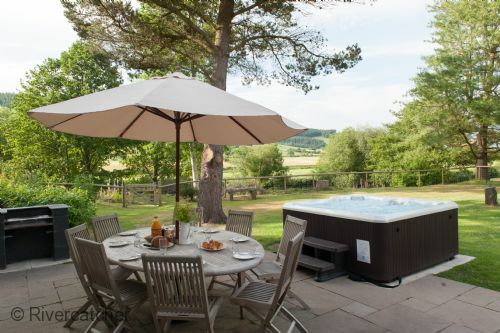 The quality of this house is outstanding with excellent facilities in a well maintained and fantastic location ...all of the staff are very helpful and our stay was enhanced by lovely special touches such as welcome basket of local produce, ample logs for the fire and hot tub towels . We thoroughly enjoyed our recent stay in Cilan Farmhouse - with beautiful views, lovely interior and very welcoming staff, you couldn't ask for more. We returned for a second time to Rivercatcher in Aug 17, staying again in Cilan. The House is very large, extremely well appointed and furnished, including very comfortable beds. 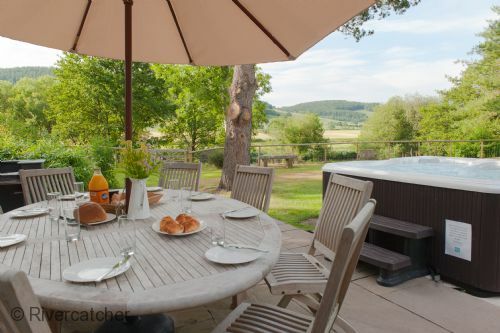 The location of Riverctacher is the highlight, in beautiful quiet countryside right on the river for fishing, with a hot tub in the garden looking over the countryside, as well as BBQ outside. Its close to many of north Wales's attractions, from walking to more adventurous pursuits such as mountain biking, white water rafting, and the various Zip World locations. I'm not often moved to write a review but the excellence we experienced at the Cilan Farmhouse deserves to be shared. From the moment we arrived, Jen, Andy and the team couldn't have done more to ensure our every need was met. Knowledgeable, helpful friendly and very accessible, they were superb. And then there's the house itself. We've stayed in f luxurious properties over the last five years, but this beats them all. The living area is just fantastic, perfect for two little ones to roam around inside and extremely comfortable for adults. It offers everything, nothing is missing, from the Netflix offering through to the well-catered and high quality kitchen. The bedrooms are great too, all of them ensuite and all of them very comfortable, clean and tastefully furnished. The private garden is very large and fenced, ensuring little ones are perfectly safe. The views from the garden are just breathtaking too, you cannot fail to be impressed. The hot tub offered something extra and is huge, easily accommodating 6 people. It's well maintained too; the team check the cleanliness of the water everyday, and ensure it's topped up as required. All in all, the best property we have ever stayed in. We will be back. Our second stay here, the first being in 2016. It was just a enjoyable as the previous one, even though we were all an year older. An excellent property with amples of room for five adults (one an OAP), three teenagers and two dogs! Had a great week with 7 of us in Cilan Farmhouse. Place nicely decorated and comfortable whilst still feeling new and very clean. 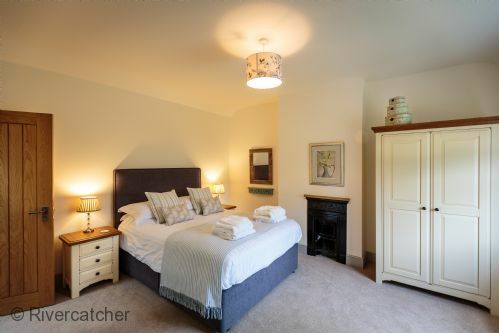 Each bedroom being en suite works particularly well for a large group and every bedroom was nice too (sometimes you get that last room that no-one wants but not here!) Lots of space downstairs for people to spread out and the patio table comfortably seated everyone. Garden is nice and genuinely dog safe with views across the river and the valley. Hot tub went down well and is checked daily. Over the moon with the standard of accommodation. The best we've stayed in so far for our get together. Beautifully decorated, comfortable, spacious and well equipped house. Perfect for our needs as a few access requirements needed for some party members. Really friendly staff. Well situated for surrounding areas. Couldn't have asked for more. It was our second visit to cilan farmhouse at overmatched and it certainly won't be our last. It's such a spacious comfortable house, meaning our family group of 2 to 68 year olds can always find their own space. 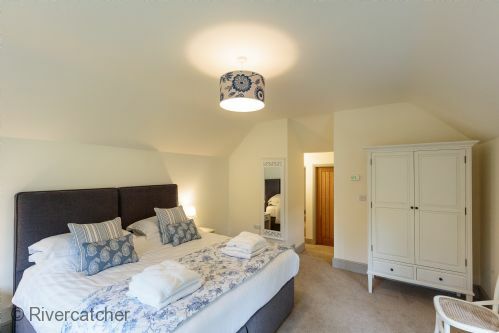 We love the fact that all the bedrooms are ensuite and equally lovely. The garden is safe for children and the surroundings are beautiful. We made full use of the hot tub overlooking the river Dee, and enjoyed time fishing for grayling and trout. The games room is great for our family competitions. The area is beautiful with many activities on offer (some of us went on the zip wire at Bethesda, or cycling at one of the trails, a couple enjoyed a romantic meal at the nearby Michelin restaurant. Aled keeps the whole space spick and span, nothing is too much trouble. It's our favourite place and we would happily recommend it to other families. Superb accommodation, superb location lovely staff,a perfect place to spend either a few days or a week we all loved it and would highly recommend it to anybody. Wonderful weekend fab location and cottage was delightful. Every need was catered for ,high quality furnishings in all rooms,log burner well equipped kitchen ,plenty of space for a large group,loved it . Thank You For an absolutely outstanding stay at Rivercatcher, my whole party & I throughly enjoyed ourselves and cannot express how impressed we were with with everything at the Cilan Farmhouse, it really is a hidden gem and I we will without a doubt be visiting again. Thank you for all your help in the lead up to our stay, it really was everything we hoped it would be and so much more. Excellent in every way but if looking for some feedback you could put lights at the bottom of the tree in the garden to light up the tree as a feature. Stunning cottage surrounded by amazing views. Finished to a high spec. Good layout and facilities. Set in a lovely little village. Special family Xmas made even more special !, would defo recommend whatever time of year. Hot tun a bonus. Can't fault this beautiful house. Absolutely stunning views, so quiet, not too far away from local amenities, very spacious, just pure Luxury. A super place to a family birthday weekend the hot tub was well used despite the frost. Walks from house good and welcome pack was very enjoyable . We booked out all the cottages at Rivercatcher for a long weekend for our wedding, which we also held on site. Our family stayed in Cilan Farmhouse, we stayed in Ghillie's Cottage and our guests in the other cottages. Andy, Jen and Bryn were a great help both leading up to and over the weekend - they answered all our questions and made sure we had everything we needed (and more) over the weekend. Rivercatcher is in a beautiful location and the cottages are fitted out to an exceptional quality - all our guests commented on how lovely they were. 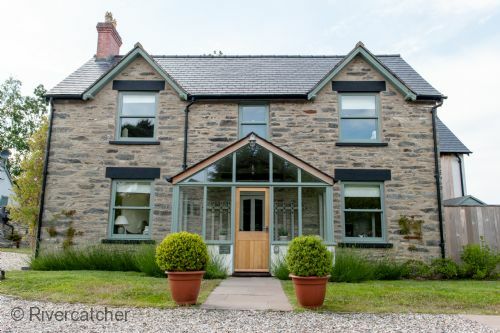 I would wholeheartedly recommend Rivercatcher to anyone for a break in a lesser-known, but beautiful area of North Wales, and we hope to be back again soon! Three generations of family celebrating 3 birthdays in this fantastic Farmhouse - the luxury accommodation suited our family perfectly as my 86 year old mum prefers a ground floor bedroom, lots of space for everyone in this high standard well equipped accommodation. Hot tub was fabulous and the Lodge kept us all entertained with our table tennis tournaments. We had a lovely meal in the Dudley Arms and enjoyed local walks. We all enjoyed ourselves so much we can't wait to return. Cilan Farmhouse is wonderful and, based on our recent experience, I would happily return again. It is easy to just tick Excellent and be done with a review like this but I truly could not fault Cilan Farmhouse so in this case the high praise is definitely deserved. It will always be possible to find fault, afterall things do go wrong on occasion however, the noisy boiler we encountered during our stay was fixed quickly and with minimum fuss and I can honestly say it did not detract in any way from the wonderful stay we had. Cilan Farmhouse is located in a quiet idilic spot next to a river that was perfect for us to explore the local area and even Anglesey beyond. It is a big, clean and very well appointed house that instantly made us feel at home. The large private hot tub (or hot swimming pool as our little one understood it) was used every night and checked/maintained every day during our week long stay. There is a games room on site which we also used a couple of times, however, most of the time we were out in the mountains or exploring the many wonderful waterfalls in the area. 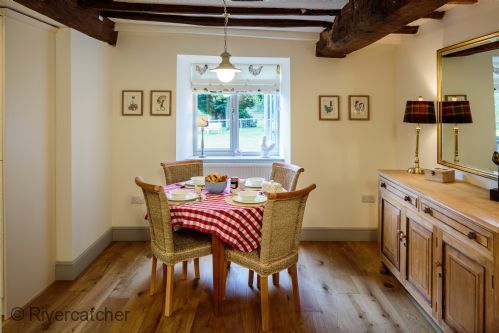 We had a wonderful stay at Cilan Farmhouse and would definitely return again ourselves as well as recommend it to families who want to explore the great outdoors or simply enjoy the internal space of the property away from the rush of modern life. Thank you Jen, Andy and Aled for making our stay so comfortable. 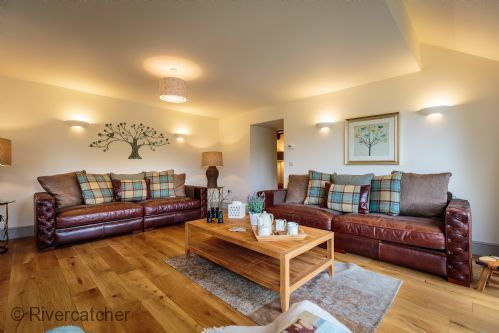 Stunning place, spotlessly clean in a very peaceful location on the side of the River Dee. Even in a group of ten adults we never felt cramped. Would recommend. We had a fantastic week away in the Cilan Farmhouse. We were well looked after we will definitely be going back again! Thanks for looking after us!